For the figure of Luke 2, see Anna the Prophetess. For other uses, see Saint Anne (disambiguation). According to apocryphal Christian and Islamic tradition, Saint Anne was the mother of Mary and grandmother of Jesus. Mary's mother is not named in the canonical gospels nor in the Qur'an. In writing, Anne's name and that of her husband Joachim come only from New Testament apocrypha, of which the Gospel of James (written perhaps around 150) seems to be the earliest that mentions them. The story bears a similarity to that of the birth of Samuel, whose mother Hannah (Hebrew: חַנָּה‎ Ḥannāh "favour, grace"; etymologically the same name as Anne) had also been childless. Although Anne receives little attention in the Latin Church prior to the late 12th century, dedications to Anne in Eastern Christianity occur as early as the 6th century. In the Eastern Orthodox Churches and Eastern Catholic Churches, she is revered as Hannah. In the Eastern Orthodox tradition, Hannah is ascribed the title Forebear of God, and both the Nativity of Mary and the Presentation of Mary are celebrated as two of the twelve Great Feasts of the Orthodox Church. The Dormition of Hannah is also a minor feast in Eastern Christianity. In Lutheran Protestantism, it is held that Martin Luther chose to enter religious life as an Augustinian friar after crying out to St. Anne while endangered by lightning. Saint Anne with Mary as a child. Stained glass depiction of Saint Anne teaching Mary. Although the canonical books of the New Testament never mention the mother of the Virgin Mary, traditions about her family, childhood, education, and eventual betrothal to Joseph developed very early in the history of the church. The oldest and most influential source for these is the apocryphal Gospel of James, first written in Koine Greek around the middle of the second century AD. In the West, the Gospel of James fell under a cloud in the fourth and fifth centuries when it was accused of "absurdities" by Jerome and condemned as untrustworthy by Pope Damasus I, Pope Innocent I, and Pope Gelasius I. Ancient belief, attested to by a sermon of John of Damascus, was that Anne married once. In the Late Middle Ages, legend held that Anne was married three times first to Joachim, then to Clopas and finally to a man named Solomas and that each marriage produced one daughter: Mary, mother of Jesus, Mary of Clopas, and Mary Salome, respectively. The sister of Saint Anne was Sobe, mother of Elizabeth. Similarly, in the 4th century and then much later in the 15th century, a belief arose that Mary was born of Anne by virgin birth, preserving Anne's body and soul intact as distinct from the doctrine of the Immaculate Conception that preserved her daughter's body and soul intact and sinless from the first moment of existence. Adherents included the 16th-century Lutheran mystic Valentin Weigel, who claimed Anne conceived Mary by the power of the Holy Spirit rather than conventional conjugal relations. This belief was condemned as an error by the Catholic Church in 1677. In the fifteenth century, the Catholic cleric Johann Eck related in a sermon that St Anne's parents were named Stollanus and Emerentia. The Catholic Encyclopedia (1907) regards this genealogy as spurious. In the Eastern church, the cult of Anne herself may go back as far as c. 550, when Justinian built a church in Constantinople in her honor. The earliest pictorial sign of her veneration in the West is an 8th-century fresco in the church of Santa Maria Antiqua, Rome. Virginia Nixon sees an economic incentive in the local promotion of the cult of St. Anne in order to attract pilgrims. The identification of Sepphoris as the birthplace of Mary may reflect competition with a similar site in Jerusalem. A shrine at Douai, in northern France, was one of the early centers of devotion to St. Anne in the West. Two well-known shrines to St. Anne are that of Ste. Anne d'Auray in Brittany, France; and that of Ste. Anne de Beaupré near the city of Québec. The number of visitors to the Basilica of Ste. Anne de Beaupré is greatest on St Anne's Feast Day, 26 July, and the Sunday before Nativity of the Virgin Mary, 8 September. In 1892, Pope Leo XIII sent a relic of St Anne to the church. In the Maltese language, the Milky Way galaxy is called It-Triq ta' Sant'Anna, literally "The Way of St. Anne". In Imperial Russia, the Order of St Anne was one of the leading state decorations. The supposed relics of St. Anne were brought from the Holy Land to Constantinople in 710 and were kept there in the church of St. Sophia as late as 1333. During the twelfth and thirteenth centuries, returning crusaders and pilgrims from the East brought relics of Anne to a number of churches, including most famously those at Apt, in Provence, Ghent, and Chartres. St. Anne's relics have been preserved and venerated in the many cathedrals and monasteries dedicated to her name, for example in Austria, Canada, Germany, Italy, and Greece in Holy Mount and the city of Katerini. Medieval and baroque craftsmanship is evidenced in, for example, the metalwork of the life-size reliquaries containing the bones of her forearm. Examples employing folk art techniques are also known. Düren has been the main place of pilgrimage for Anne since 1506, when Pope Julius II decreed that her relics should be kept there. The Church of Saint Anne in Beit Guvrin National Park was built by the Byzantines and the Crusaders in the 12th century, known in Arabic as Khirbet (lit. "ruin") Sandahanna, the mound of Maresha being called Tell Sandahanna. Basilica of Sainte-Anne-de-Beaupré, Quebec, Canada. Saint Anne is patroness of unmarried women, housewives, women in labor or who want to be pregnant, grandmothers, educators and teachers. She is also a patroness of horseback riders, cabinet-makers and miners. As the mother of Mary, this devotion to Saint Anne as the patron of miners arises from the medieval comparison between Mary and Christ and the precious metals silver and gold. Anne's womb was considered the source from which these precious metals were mined. Saint Anne is also said to be a patron saint of sailors and a protector from storms. She is also the patron saint of: Brittany (France), Chinandega (Nicaragua), the Mi'kmaq people of Canada, Castelbuono (Sicily), Quebec (Canada), Santa Ana (California), Norwich (Connecticut), Detroit (Michigan), Adjuntas (Puerto Rico), Santa Ana and Jucuarán (El Salvador), Berlin (New Hampshire), Santa Ana Pueblo, Seama, and Taos (New Mexico), Chiclana de la Frontera, Marsaskala, Tudela and Fasnia (Spain),Town of Sta Ana Province of Pampanga, Hagonoy, Santa Ana, Taguig City, Saint Anne Shrine, Malicboy, Pagbilao and Quezon (Philippines), Santana (Brazil), Saint Anne (Illinois), Sainte Anne Island, Baie Sainte Anne and Praslin Island (Seychelles), Bukit Mertajam and Port Klang (Malaysia), Kľúčové (Slovakia) and South Vietnam. The parish church of Vatican City is Sant'Anna dei Palafrenieri. There is a shrine dedicated to Saint Anne in the Woods in Bristol, United Kingdom. 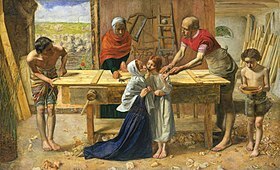 In John Everett Millais's 1849–50 work, Christ in the House of His Parents, Anne is shown in her son-in-law Joseph's carpentry shop caring for a young Jesus who had cut his hand on a nail. She joins her daughter Mary, Joseph, and a young boy who will later become known as John the Baptist in caring for the injured hand of Jesus. The subject of Joachim and Anne The Meeting at the Golden Gate was a regular component of artistic cycles of the Life of the Virgin. The couple meet at the Golden Gate of Jerusalem and embrace. They are aware of Anne's pregnancy, of which they have been separately informed by an archangel. This moment stood for the conception of Mary, and the feast was celebrated on the same day as the Immaculate Conception. Art works representing the Golden Gate and the events leading up to it were influenced by the narrative in the widely read Golden Legend of Jacobus de Voragine. The Birth of Mary, the Presentation of Mary and the Marriage of the Virgin were usual components of cycles of the Life of the Virgin in which Anne is normally shown here. Her emblem is a door. She is often portrayed wearing red and green, representing love and life. Anne is never shown as present at the Nativity of Christ, but is frequently shown with the infant Christ in various subjects. She is sometimes believed to be depicted in scenes of the Presentation of Jesus at the Temple and the Circumcision of Christ, but in the former case, this likely reflects a misidentification through confusion with Anna the Prophetess. There was a tradition that Anne went (separately) to Egypt and rejoined the Holy Family after their Flight to Egypt. Anne is not seen with the adult Christ, so was regarded as having died during the youth of Jesus. Anne is also shown as the matriarch of the Holy Kinship, the extended family of Jesus, a popular subject in late medieval Germany; some versions of these pictorial and sculptural depictions include Emerentia who was reputed in the 15th Century to be Anne's mother. In modern devotions, Anne and her husband are invoked for protection for the unborn. The role of the Messiah's grandparents in salvation history was commonly depicted in early medieval devotional art in a vertical double-Madonna arrangement known as the Virgin and Child with Saint Anne. Another typical subject has Anne teaching the Virgin Mary the Scriptures (see gallery below). Saint Anne and Virgin Mary. Josef Moroder-Lusenberg school (around 1890) in Badia. The instruction of Mary. Catholic parish church of St. Martin in the district of Dillingen (Bavaria). The Education of the Virgin. Guido Reni. St. Anne teaching St. Mary. Josef Winterhalder the Younger. The education of the Virgin. Eugène Delacroix. The Education of the Virgin Mary. Jean Jouvenet. Mary and St. Anne. Iglesia del Salvador, Seville. Education of Virgin Mary. Parish church Saint Vinzenz. ^ "O my Lord! I do dedicate into Thee what is in my womb for Thy special service: So accept this of me: For Thou hearest and knowest all things." (Qur'an 3:35). ^ a b Fongemie, Pauly. "SYMBOLS IN ART". Catholic tradition. Retrieved 2019-01-15. ^ Nixon, Virginia (2004). Mary's Mother: Saint Anne in Late Medieval Europe. The Pennsylvania State University Press. pp. 12–14. ISBN 978-0-271-02466-0. ^ "Martin Luther — Our Spiritual Guide". Evangelical Lutheran Church in Canada website. Retrieved 17 December 2012. ^ Brecht, Martin (1985). Martin Luther: His road to Reformation, 1483–1521. Fortress Press. p. 48. ISBN 978-1-4514-1414-1. ^ a b Wheeler, Brannon M. (2002). Prophets in the Quran: an introduction to the Quran and Muslim exegesis. Continuum International Publishing Group. ISBN 0-8264-4957-3. ^ a b Da Costa, Yusuf (2002). The Honor of Women in Islam. LegitMaddie101. ISBN 1-930409-06-0. ^ a b c "Reames, Sherry L. ed.,"Legends of St. Anne, Mother of the Virgin Mary: Introduction", ''Middle English Legends of Women Saints'', Medieval Institute Publications, Kalamazoo, Michigan, 2003". Lib.rochester.edu. Retrieved 2013-08-15. ^ "Golden Legend II.131". Catholic-forum.com. Archived from the original on June 5, 2013. Retrieved 2013-08-15. ^ a b c "Holweck, Frederick. "St. Anne." The Catholic Encyclopedia. Vol. 1. New York: Robert Appleton Company, 1907. 3 May 2013 "The renowned Father John of Eck of Ingolstadt, in a sermon on St. Anne (published at Paris in 1579), pretends to know even the names of the parents St. Anne. He calls them Stollanus and Emerentia. He says that St. Anne was born after Stollanus and Emerentia had been childless for twenty years"". Newadvent.org. 1907-03-01. Retrieved 2013-08-15. ^ Butler, Alban; Orsini, Mathieu (1857). The lives of the fathers, martyrs, and other principal saints. ed. by F.C. Husenbeth. [With] The history of the blessed virgin Mary, by the abbé Orsini, tr. by F.C. Husenbeth. London: Henry. p. 97. ^ a b c "Lives of Saints, John J. Crawley & Co., Inc". Ewtn.com. Retrieved 2013-08-15. ^ a b "Saint Anne and Saint Joachim, Our Lady of Mt. Carmel Parish, Ottawa, Ontario". Olomc-ottawa.com. Archived from the original on 2014-08-10. Retrieved 2013-08-15. ^ "The Milky Way Project – It-Triq ta' Sant'Anna | What is the Milky Way?". maltastro.org. Retrieved 2015-11-02. ^ "Arm Reliquary Sainte-Anne-de-Beaupré Shrine, Quebec". Shrinesaintanne.org. 1960-07-03. Archived from the original on 2013-05-08. Retrieved 2013-08-15. ^ "Flickr photograph of the so-called 'speaking reliquary' (tells the pilgrim what is venerated)" (in German). Flickr.com. 2010-10-06. Retrieved 2013-08-15. ^ Bender (2010-07-26). "Arm relic Basilica of Saint Paul Outside the Walls|Papal Basilica of Saint Paul Outside the Walls". Vita-nostra-in-ecclesia.blogspot.com. Retrieved 2013-08-15. ^ "Butler, Alban. ed. Michael Walsh. Lives of the Patron Saints. Burns and Oates: Kent, 1987. p. 53-4". Mcah.columbia.edu. Retrieved 2013-11-03. ^ "St. Anne – Archdiocese of Detroit". Aod.org. Retrieved 2013-08-15. ^ Some writers gave her age at death, as part of a general family chronology, but no generally accepted tradition developed on this point, even during the Middle Ages. ^ O. Bitschnau: Das Leben der Heiligen Gottes 1883, 558. Wikimedia Commons has media related to Saint Anne. Brief American Catholic article on "Sts. Joachim and Ann"
Welsh, Jennifer. The Cult of St. Anne in Medieval and Early Modern Europe. Routledge, 2017. This page was last edited on 11 April 2019, at 10:09 (UTC).